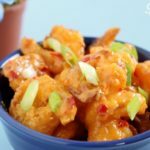 The copycat Bonefish Grill bang bang shrimp recipe that will have everyone asking for more! 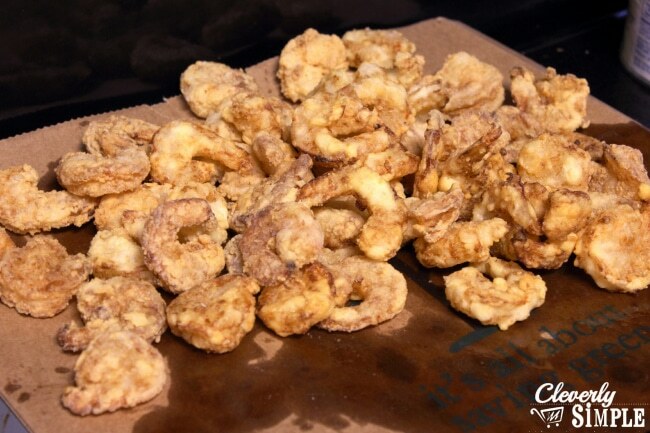 Made with one pound of shrimp, it’s the perfect appetizer! Have you ever been to Bonefish Grill? I’ve only been a few times, but one of their appetizers left me almost speechless. It takes a lot for me to say that about a meal I’m having to pay for at a restaurant. The first time I had bang bang shrimp, was years ago. We’re talking pre-kids years ago. We went with our friends who were living in Washington D.C. and before we ordered they insisted that we get bang bang shrimp as an appetizer. Since I had never eaten there, I was totally up for whatever they recommended. I like shrimp. Well, let me tell you. I don’t remember anything else about that meal besides the great company – and the bang bang shrimp. I couldn’t even tell you what I ate as my main course. Years later, I went to Bonefish Grill again, and I got bang bang shrimp as my main meal. Why mess with perfection, right? 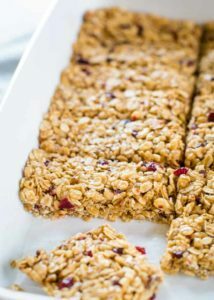 So, when I saw this recipe I had to share it with you! You can make this awesomeness at home. And this is a WOW dish. It’s a I-feel-like-cooking-tonight dish. It’s also a great one to make when shrimp is on sale, because let’s be honest shrimp can be pricey. In terms of shrimp here in Ohio, getting it frozen is your best best. Although, it might be cheaper if you buy it from the meat department thawed. Double check the prices before you purchase. 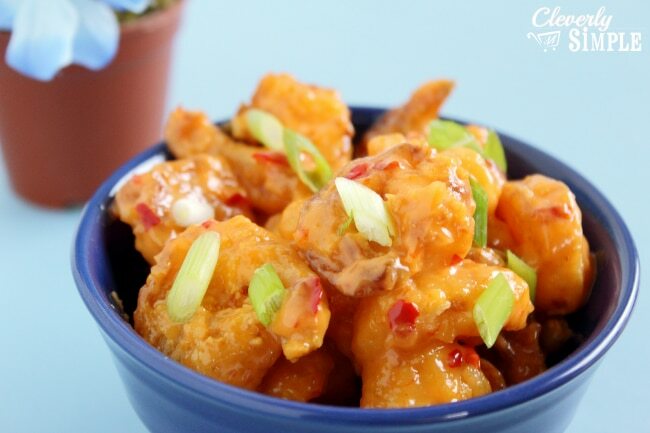 How Do You Make Bang Bang Shrimp? Start out this awesome recipe by heating the oil in a large heavy pot. (I would use a stock pot like this one.) You want to heat the oil to 375˚. I use a candy thermometer to double check the temperature. 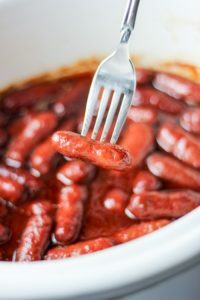 In a large bowl combine the Miracle Whip, sweet chili sauce, ½ teaspoon of chili garlic sauce and salt. Taste and adjust the chili garlic sauce to taste. It is spicy! I usually use about a teaspoon. Set aside. 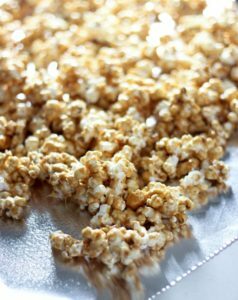 Fill one bowl with ½ Cup of Corn Starch. In another bowl add your buttermilk. Drain and pat the shrimp dry. Working in small batches, let the shrimp moisten in the buttermilk, then dredge it in the corn starch. (Add cornstarch to bowl as needed.) Place in hot oil and cook until a deep golden brown. Place on paper towel lined plate or paper bag to drain excess oil. Repeat with remaining shrimp. Toss Shrimp in bowl with sauce to coat and serve immediately with green onions sprinkled on top. Watch your tastebuds EXPLODE! Seriously, so good! If your family likes shrimp they will not be disappointed by this dish. 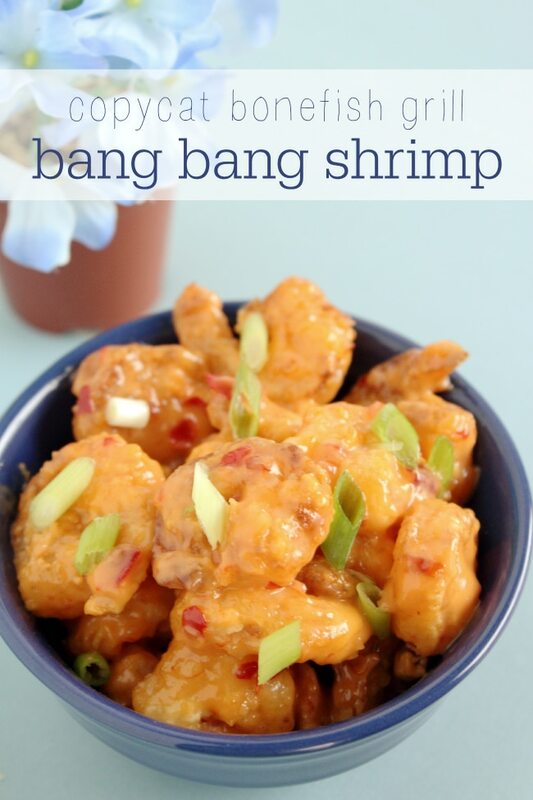 Make the popular bang bang shrimp with this copycat recipe using frozen shrimp! Start heating 2-3 inches of oil in a large heavy pot to 375˚. 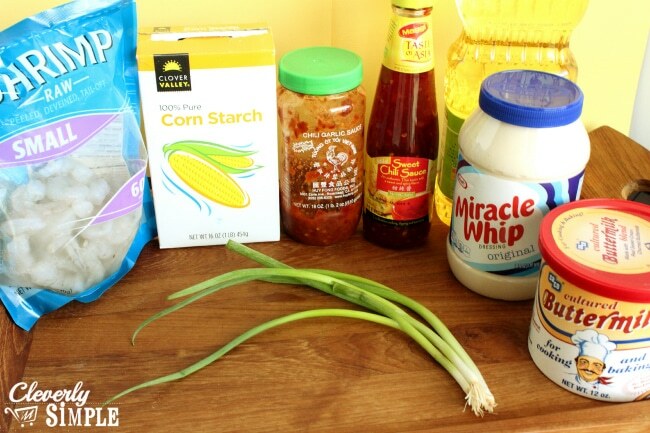 In a large bowl combine the Miracle Whip, Sweet Chili Sauce, ½ tsp Chili Garlic Sauce and Salt. Taste and adjust the Chili Garlic Sauce to taste, it is spicy, I usually use about a teaspoon. Set aside. In two small bowls put ½ the Corn Starch in one and the buttermilk in the other. Drain and pat the shrimp dry. Working in small batches, let the shrimp moisten in the buttermilk. Dredge in the corn starch. Add cornstarch to bowl as needed. Place in hot oil and cook until deep golden brown. Place on paper towel lined plate or paper bag to drain excess oil. Toss Shrimp in bowl with sauce to coat and serve immediately with green onions sprinkled on top. What if I don’t have buttermilk. ?? We love this!!!! It was a little more time consuming then I thought, but worth the time. 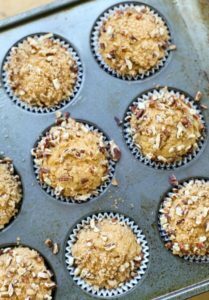 It is not often that the whole family loves the same recipe! Thanks for sharing. FYI make sure the tails are off the shrimp ?.